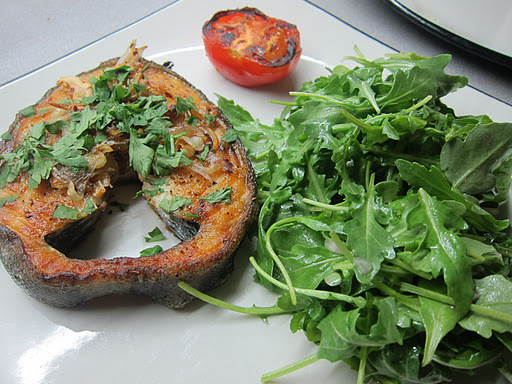 ← Wild Rose Detox, Day 3 – Fish Day! If I may take a little break from the matter at hand, I’d like to wish Happy Chinese New Year to everyone! May this lucky Year of the Dragon bring happiness and good fortune to you all. I’ve just been online to try and determine what sort of year this is going to be for me. Despite the fact that I’m half Chinese, I don’t really know much about solar and lunar calendars, what my ba zi element is – I only just found out there is such a thing as a ba zi element when I went online and googled my fortune…! I must say I feel I’ve let you down a bit and have lost a bit of momentum in my creativity, in terms of the food that I’ve been preparing for this blog. I was hoping that I could come out with recipes that made you go “WOW!” every day, but some days, all I feel like eating are a simple salad or a piece of fruit. Having said that, I did try a couple of new recipes over the past few days. I’ve also been out to eat for two meals, and was happy to take a break from cooking! I was scared that I might be limited by the choices on the menu, but the two restaurants I chose are really wonderful for anyone on a detox or health mission. 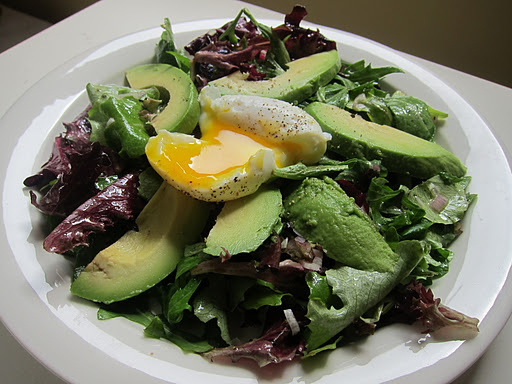 On Day 4 (Friday), I had a simple salad of mixed leaves, quinoa, avocado and a soft boiled egg. The quinoa was hidden under the salad leaves, and I love how the runny yolk runs into the salad and soaks into the quinoa like another layer of dressing. For the soft egg, boil it in water for 5-6 minutes, crack the shell and remove as much of it as you can. To not break the egg, my trick is to take a tablespoon and slip it between the egg and the shell to effectively scoop it out of the shell. 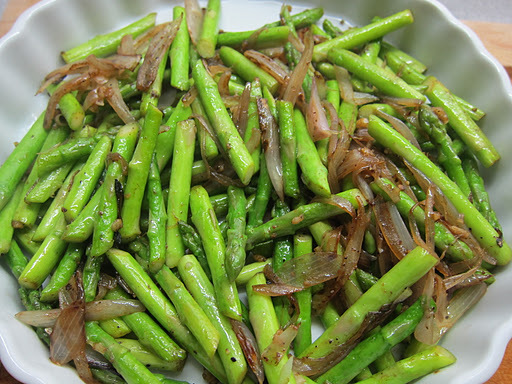 Dinner was a simple stir-fry of asparagus, garlic and shallots. 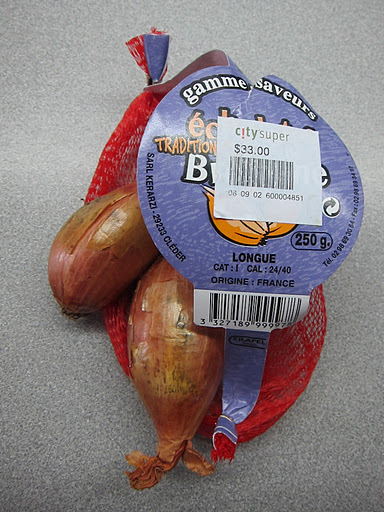 PB has converted me, and I now only use French shallots, available at CitySuper or grEAT. They are more fragrant and flavorful, and I use them in salads and cooked dishes alike. 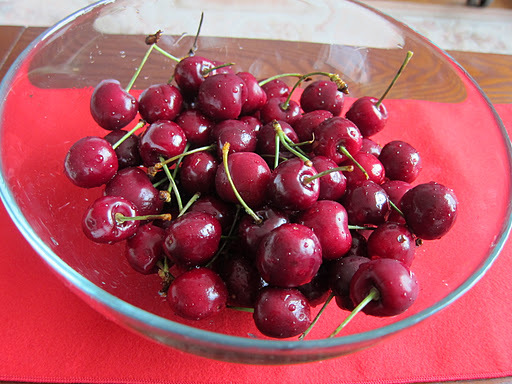 On Day 5 (Saturday), breakfast was a huge bowl of cherries, and lunch was more like brunch. I am a huge fan of brunches, because it’s an excuse to eat breakfast for lunch! 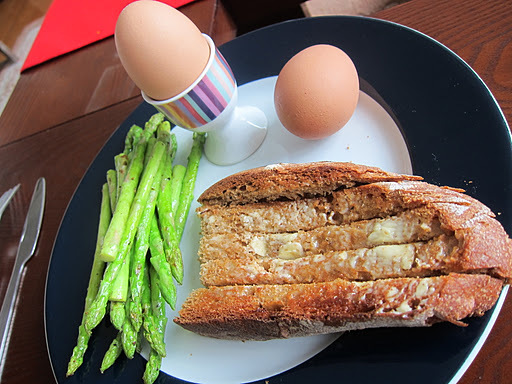 On weekends I love to get creative with eggs – eggs, glorious eggs! 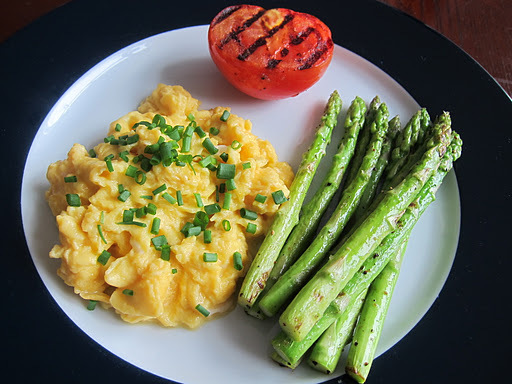 Poach ’em, fry ’em, bake em’, scramble ’em – they are a wonderful, complete and balanced diet in one shell (in moderation of course). I like my eggs hotel-style, soft and a little runny. I beat 2 eggs with a bit of water (milk or cream when I’m not on detox! ), salt and pepper. Cook them in a saucepan over low heat, watching constantly and stirring frequently. When the eggs are still a bit wet, add the chives and turn off the stove – the eggs will continue to cook a little in the pan. Our friend ER is in town so we had a big dinner gathering. Because of the detox, my friends were forced to eat somewhere more healthy and less atmospheric, but they are all troopers and went along with it. I booked a table at Pure Restaurant in Soho, although it was rather unnecessary since the restaurant was pretty much empty at the back section when we arrived. They have a great selection of menus (brunch, set lunch, afternoon tea), and their all-day menu has many healthy choices, vegetarian options as well as some with nutritional values. Portions are on the large side, and the staff were happy to answer my questions and also helpful when I requested that cooking was limited to only using olive oil. 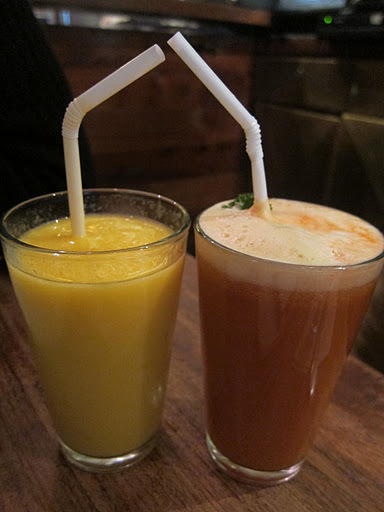 They also have a great selection of yummy juices, smoothies, and protein shakes if that is what you’re into. I didn’t take any photos, but ordered a rib eye steak with vine tomatoes, spinach (instead of mushrooms) and green beans. It was an indulgence, but still part of the ‘acceptable foods’ column – the word ‘acceptable’ stretches to include more than it probably intends to for me, but I try to control myself in the interests of losing a couple of kilograms! Day 6 (Sunday) was Chinese New Year Eve, and this is the night that my family gathers for a big feast. My mother is not only serious about food, but she is really serious about entertaining! She not only is a most gracious host, but she prepares so much food that you always leave home close to bursting. It was not without guilt that I decided to write off my detox for this evening, I didn’t take the supplements but still chose to stay away from alcohol, drinking Perrier with lime in a champagne flute for the whole evening (pats self on back)! Everything else on the menu was fair game (in moderation). We bao-ed (wrapped) our own homemade jiaozi (dumplings), and had roast suckling pig, roast goose, two whole steamed fish, prawns with homemade sweet and sour sauce, grilled pork neck char siu, chicken and abalone soup, and three types of vegetables. On Day 7, I definitely felt a bit heavier, and perhaps it was the guilt talking but it was as if I wiped out all the efforts of my past week. After not eating certain foods for some time (even if it is just a week), your stomach is not used to grease and oil, and especially the flour and carbs. Hopefully a desire to avoid this discomfort is something that will help me want to maintaining a healthy and light diet even after the detox. 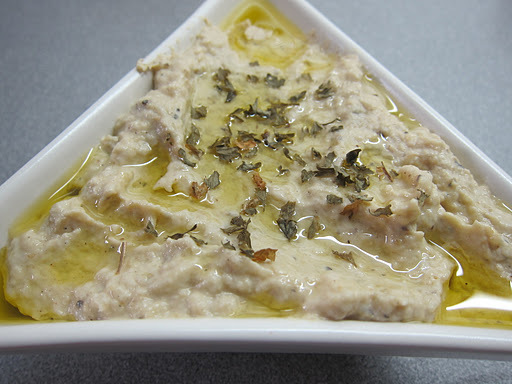 I woke up early in the morning and excitedly took out the ingredients to make my Baba Ghanoush! 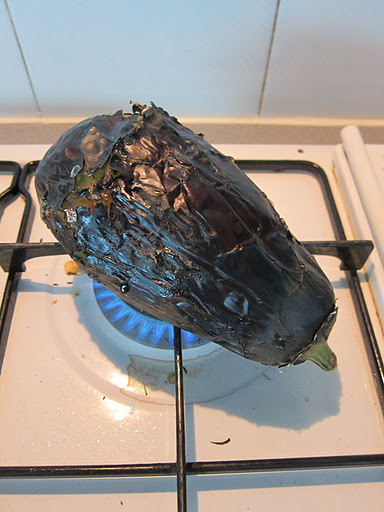 After washing, place the eggplant directly on the gas hob (or under the grill), turning occasionally until the skin is evenly black and blistering – this will take around 10 to 15 minutes, and gives it a smoked flavour. 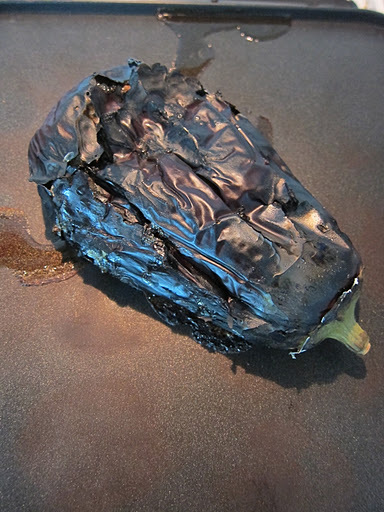 Transfer the eggplant directly onto a baking sheet and pop in the middle of the oven until very soft, about15-20 minutes. Remove it from the oven and let it cool. Peel off and discard the skin. Make sure to get it all, it’s annoying having to pick out all the black skin bits once it’s been mixed, believe me! 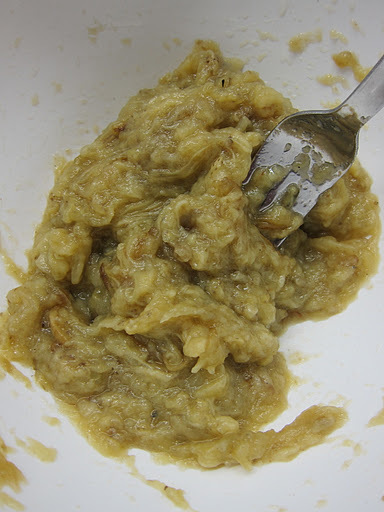 Place the eggplant flesh in a bowl and mash it up into a paste using a fork. Add the tahini, garlic, lemon juice and cumin. Mix well, and season with salt.Transfer the mixture to a serving bowl, drizzle the olive oil on top and sprinkle with parsley. Voila! It should last you as a snack for a couple of days for one. For the both of us, it was gone within the day! A word of caution: when you are opening the jar of tahini, make sure to do it over a surface, and carefully. There is a thick layer of oil that settles on the top that will have to be mixed thoroughly before using. Typically, I spilt a lot of this oil all over the countertop and it was a mess and a half! 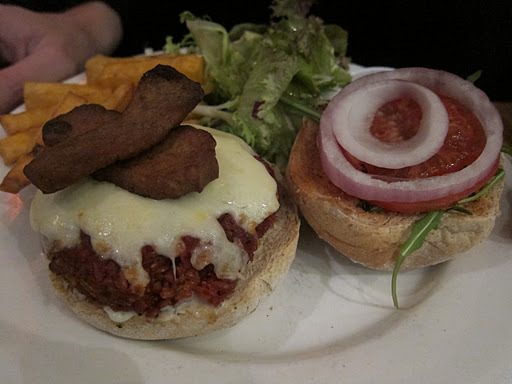 We went for lunch with J&M at Life Cafe in Soho. It is a natural choice for food that adheres to the detox program, and I also go quite regularly to pick up food after the gym – they do great lunch boxes. This is a great place to go if you are detoxing (or not!) and can’t be bothered or don’t have time to cook lunch or dinner: make a selection of 2 or 3 delicious salads and take it in a box to go (deli counter open until 9.30pm). 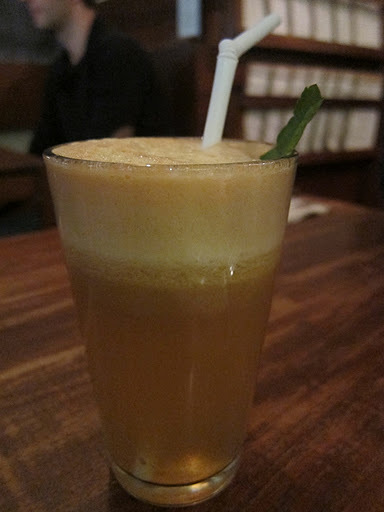 We ordered fresh juices to start: 2 carrot, apple and gingers, fresh apple juice, and a mango orange. Yum. 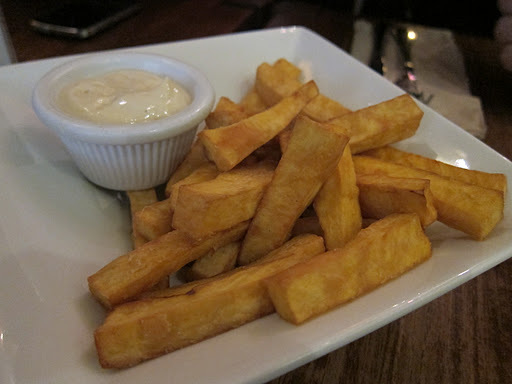 Sweet potato fries with ‘tofunaise’ – made with tofu, olive oil, lemon juice and mustard. The mustard made it a no-go for me, but the fries were tasty, salty, and crisp – all the things you miss in a potato fry! 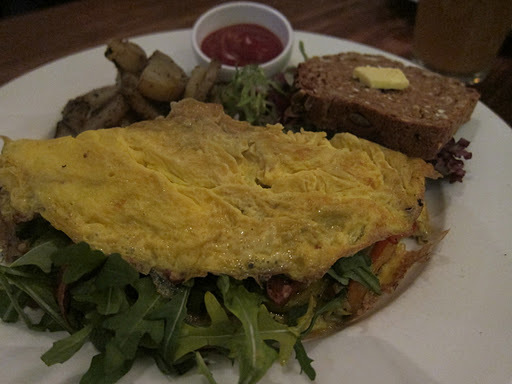 Italian Omelette: Artichoke, peppers, rocket, pesto, vegetarian sausage, mozzarella cheese and rocket. I was so excited by everyone else’s meals that I forgot to take a picture of my own! I ordered the Life deli salad selection, a huge plate covered with 3 salads, broccoli (hold the feta), quinoa and tofu, and a deal at $88! I can never get my quinoa to taste as good as theirs no matter how I try, it’s quite frustrating! 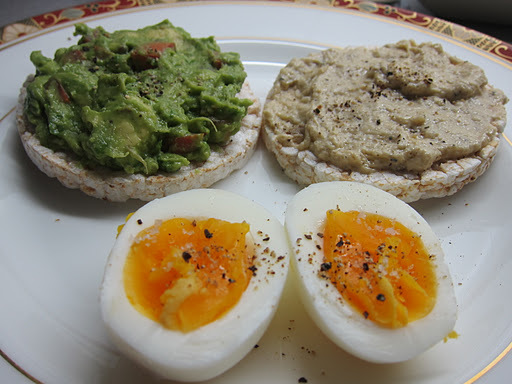 A duo of guacamole and baba ghanoush on rice cakes, with boiled egg. I ‘borrowed’ the black cod steak from my mother’s freezer, she buys a whole frozen fish from Woo Hing Hong Frozen Meats in Causeway Bay, and has them cut them into thick steaks for her. It’s a delicious tasty fish, and is lovely to eat just pan fried with salt and pepper, 3-4 minutes each side depending on thickness. For the garnish, heat a small amount of olive oil in a pan until just hot. Add sliced garlic, shallot and fresh chopped chili (or chili flakes), and cook over very low heat to infuse the oil. The turn up a bit to crisp the garlic and pour over the fish. Day 8 (Tuesday), PB made another amazing meal, a recipe that he found and adapted for my detox, and it was so tasty! I’d highly recommend for you to try it – it takes a bit more time, but it’s worth it. 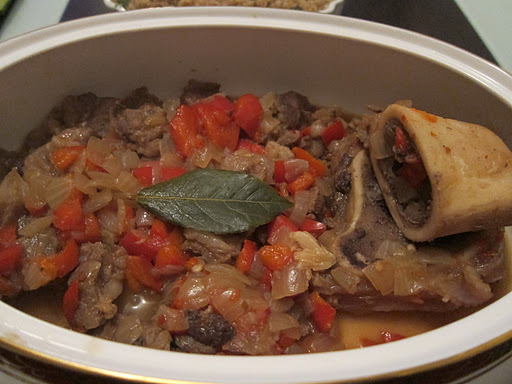 Axoa, pronounced “achoa”, is a veal stew from Pays Basque. It’s hearty and at the same time the veal is light and flavorful. Cut the veal, onions, and peppers roughly into 1-2cm cubes. Cook the veal in a frying pan with the olive oil until the water from the meat has evaporated. This recipe called for shoulder, but the veal shank was very flavorful – he removed the meat from the bones, then saved the bones. In a pan deep enough to cook the stew, heat some oil then add the onions, peppers, chilies, garlic and bay leaf and cook until soft. Add the dried chili flakes (to taste) and the water, then cover. If using veal shank, add the bones to the pan here, and they will make a stock while stewing. Cook over low heat for 40 minutes, until the sauce has reduced. We ate it together with plain quinoa. Even without the stock, this was a very effective dish. I am determined to see this detox through, and feel like I’ve done myself an injustice by eating that Chinese New Year Dinner. There’s no use crying over spilt soy milk, and it would have been a miserable CNY if I had stuck to just steamed fish while everyone else’s chopsticks danced around the table, clearing the serving dishes at will. Therefore I’ve decided to continue the detox past the required 12 days, for a further 5 days until the 2nd of February, to make up for the days preceding CNY. For the moment, 9 more days and counting! Exercise: Friday – none. Saturday – Hatha Yoga. Sunday – A walk around The Peak. Monday – Hike from Braemar Hill to KornHill. Tuesday – 5km on the treadmill. How I feel in 3 works or phrases: Guilty, recharged with a renewed goal, like a lucky rooster.